A horror fantasy about the worst fears of parents and children, Before I Wake imagines a married couple, Jessie (Kate Bosworth) and Mark (Thomas Jane), trying to move on after their son’s death by taking in an 8-year-old orphan who’s gone from foster home to foster home under mysterious circumstances. Waiting for the new arrival, Mark screws grab bars to the tub wall (their boy drowned in the bath, which is basically every first-time parent’s nightmare) while Jessie takes down the family photos from the living room, enacting an unwittingly creepy ritual of preparation; skewed in a horror movie’s exposition, the things adults think will make kids safe seem conspiratorial and sick. But slyly, the film keeps turning viewer sympathies about who might be the bigger threat to whom. As the new foster parents soon discover, the kid, Cody (Room’s Jacob Tremblay), possesses a dangerous supernatural power, and when he falls asleep, his dreams haunt the house—projections of a small child’s manias (butterflies are Cody’s favorite subject) and uneasy thoughts about grown-ups and themselves. Often, Cody dreams of the dead son, Sean (Antonio Romero), the little boy’s face unnervingly frozen in the rictus of the only photo of him he’s seen. Of course, there’s a bona fide monster lurking somewhere in the back of Cody’s head—a bone-white ghoul that he calls the Canker Man—not to mention the question of whatever happened to his last foster family, who disappeared without a trace. 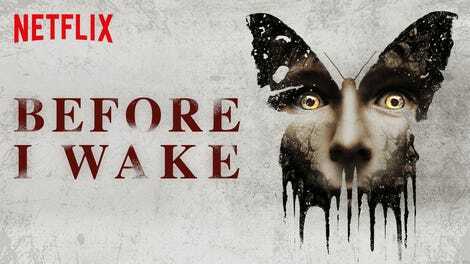 But Before I Wake invests less in don’t-look-now scares than in parent-child insecurities, morphing into a more conventional horror film only as Jessie’s attempts to exploit her foster child’s phantasmic unconscious get out of hand—a metaphor of repressed guilt and projected grief drawn with a clarity that has become characteristic of the movie’s director and co-writer, Mike Flanagan (Oculus, Ouija: Origin Of Evil), a prolific genre specialist who, for better or worse, always seems more interested in dramatic tension and character psychology than howling terror. 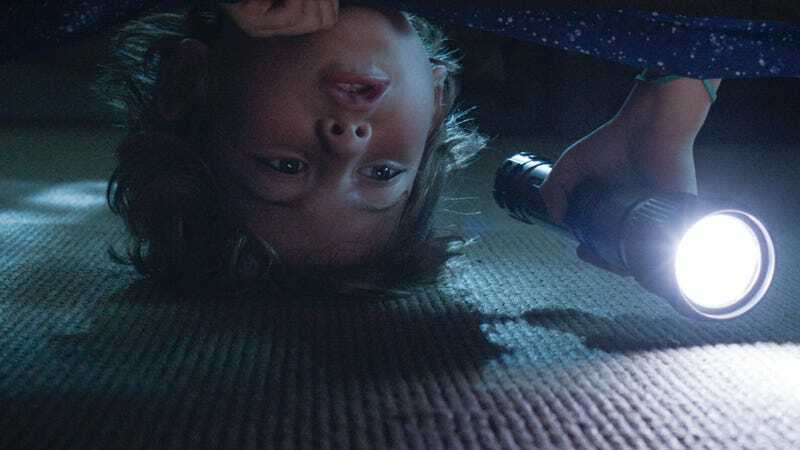 Horror movies that exploit broad childhood phobias about bedtime lights-outs and basement chores are a dime a dozen, but it’s really refreshing to find one made with a parent’s curiosity and concern for a child’s point of view. With his clean sense of widescreen composition, Flanagan often keeps Cody small and centered in the frame, a strategy that effectively mimics a little kid’s distorted perception of scale. His anxieties are believable—the super-kid as bed-wetting child, hiding his powers like a clumsily balled-up sheet. Before I Wake has its imperfections and moments of narrative lag, but its thoughtful touches and attention to character load Cody’s abilities and the threat of the Canker Man with a dramatic weight that often outbalances the generically spooky imagery. (There’s one nice detail: The monster has no nose or ears, like a child’s drawing.) The fears it juggles are strictly real: not being loved, not loving enough. Arriving mere months after Flanagan’s last film, the Stephen King adaptation of Gerald’s Game, the film has something of a troubled backstory of its own: Shot in 2013, the film was delayed and finally shelved when its original distributor declared bankruptcy, and is now making its belated debut on Netflix. (The streaming giant previously distributed Gerald’s Game and Flanagan’s underappreciated home-invasion thriller Hush.) With a large part of the country in a cold snap, consider it a stay-at-home alternative to trekking out to see the latest from the James Wan jump-scare factory.